Hilaire grew up in Melbourne but moved to London half a lifetime ago. 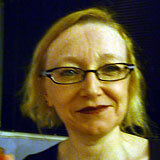 She has had short stories and poetry published in several anthologies and various magazines, including Magma, Brand, Brittle Star, Wet Ink, Parallax and The Interpreter’s House. Triptych Poets: Issue One (Blemish Books, Australia, 2010) features a selection of her poems. Her novel Hearts on Ice was published by Serpent’s Tail in 2000. She is currently working on a joint poetry collection with Joolz Sparkes, London Undercurrents, unearthing the voices of feisty and resilient women who have lived and worked in the capital.